Welcome to Minnesota and the Great North Woods! This year’s ICSE social event has been designed to give you, our ICSE attendees, a taste of Minnesota life. You will be transported from the Minneapolis Hilton to Nicollet Island, a small private island, which sits in the middle of the mighty Mississippi River. To get to the island, we will cross the world’s smallest suspension bridge. This island has a small residential area built in the late 1800’s and the Island Pavilion where our event will be held. The Pavilion was initially built in 1886, for William Bros Boiler Works. It was completely destroyed by a fire in 1893, and was replaced with the building you see today. 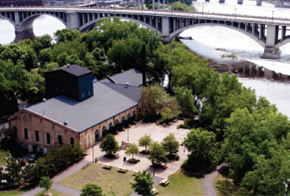 The Pavilion offers views of downtown Minneapolis, the Stone Arch Bridge and the 1858 Horseshoe-shaped Dam – the first dam on built on the Mississippi River. This lovely contained island is easily explored on a bicycle or the newest technology fashion – the Segway. We will be providing Segways for our ICSE attendees to use during the social event and explore the island. 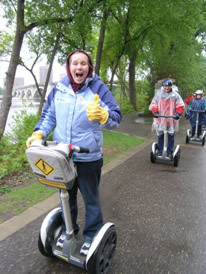 Instructions and safety equipment will be provided before you start your Segway mini tour. Minnesota has always been known for the amazing fishing you find in its 12,000 lakes. You will have your chance to enjoy fishing at its very easiest. A 10,000-gallon trout pond will be stocked with hundreds of fish and instructors will assist and hand out poles so everyone can get a chance to bag the big one! Prizes will be given for the largest and, of course, the smallest fish. Guests will dine from bountiful buffets, featuring local favorite dishes – Walleye pike; corn on the cob roasted in the husk; Minnesota Paella with wild rice; Campfire S’mores and more. For centuries, Minnesota has been home to American Indians from the Dahcotah, Sioux, Cheyenne and Chippewa tribes. All around the activity area will be displays of authentic teepees to walk through and admire. Camp fires and a traditional tribal camp will be set up in a village environment so you can sit in and listen to the Native American elders tell stories, watch crafts being made and participate in handy craft games. A traditional American Indian game is the tomahawk toss. Several wooden discs will be placed in a designated area and will give you the opportunity to hurl the tomahawk and win a prize. Archery was the hunting tool of choice for the American Indian. You will be taught the art of the bow with decorated equipment on a hay bale laden range. Additional entertainment for the evening will be several performances of Native dancers and the rhythmic sounds of the drummers.